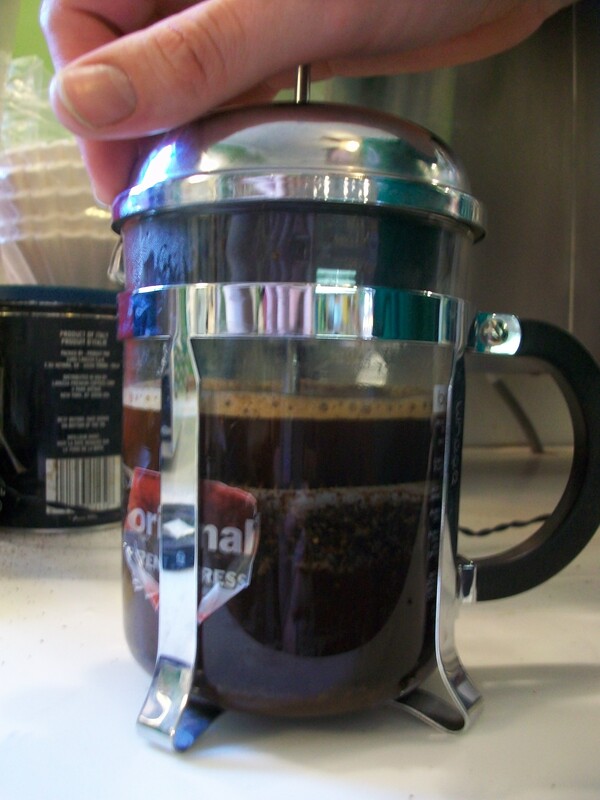 Quick history lesson, friends: The French Press, or Coffee Plunger (that’s not a joke, in countries like New Zealand, Australia and South Africa, it’s called a Coffee Plunger!) as it’s known today came into existence around 1929 when a dude named Attilio Calimani patented something close to what you see in stores and coffee houses these days…well…It was modded a bit by a guy named Faliero Bondanini, who messed with it until it looked like what I’m using today. He got a patent for this design in 1958, so by most standards, this is a pretty new way of making coffee. 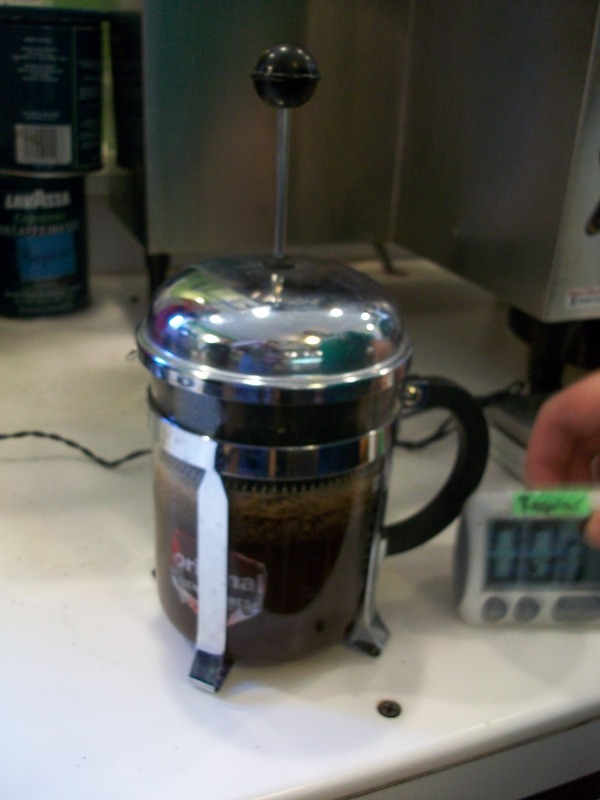 Aside from drip coffee, many would argue that this is the most popular. Alright alright…No more history. Time to get our hands dirty. 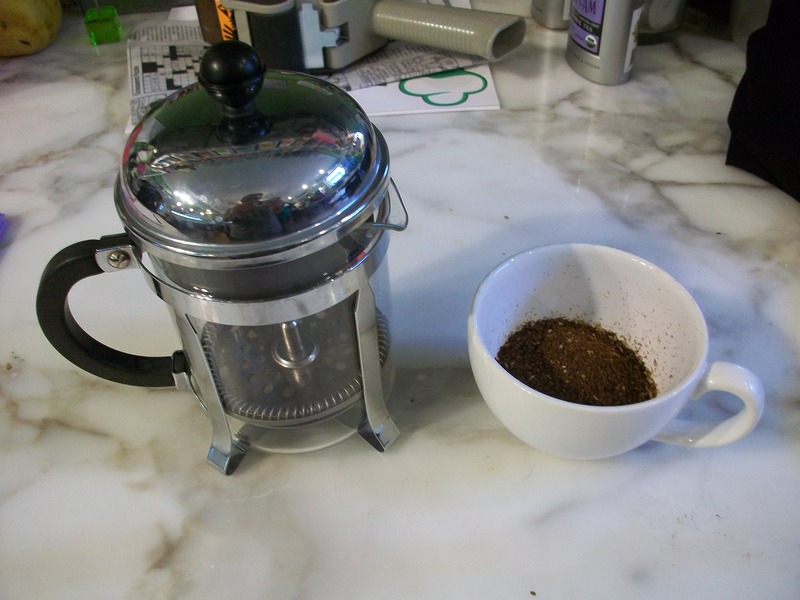 For starters, you’re going to want to take about 25 grams of coffee and grind it down. 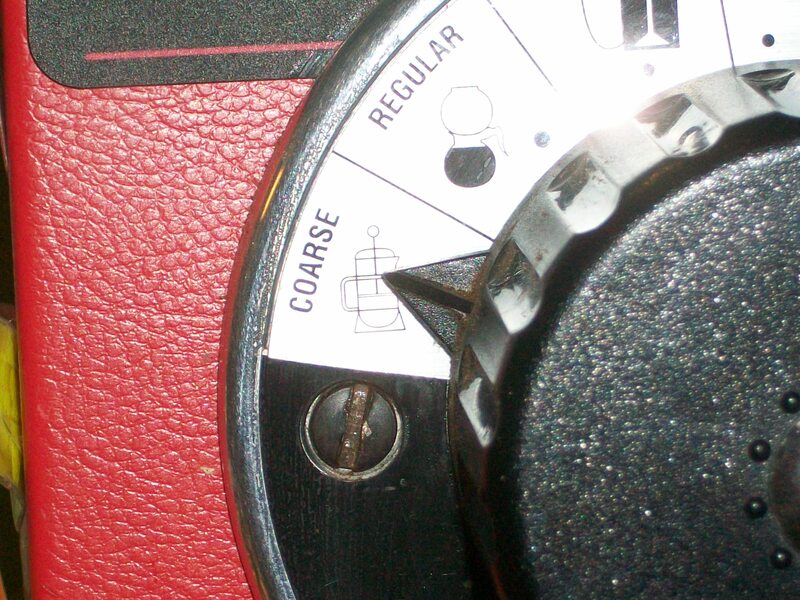 Use a coarse setting on the grinder, and if you don’t have a grinder at your house, whoever grinds it for you will know what to do. I’ve even seen grinders in grocery stores that have different settings. Pretty, isn’t it? Now that you’ve got them all ground up, take a deep breath. Fresh ground coffee is simply intoxicating. That isn’t gonna help you brew your cup any faster, but sometimes you need to stop and smell the rose–er–coffee grounds. What kind of coffee should you be using?? Well…Almost anything! I prefer to use espresso beans (as mentioned in the previous post), but you can use light roast, dark roast, decaf, it doesn’t matter. I wouldn’t recommend using stuff you get in a can for $4 at the grocery store. We can sell you Metropolis stuff, and grind it for you!! 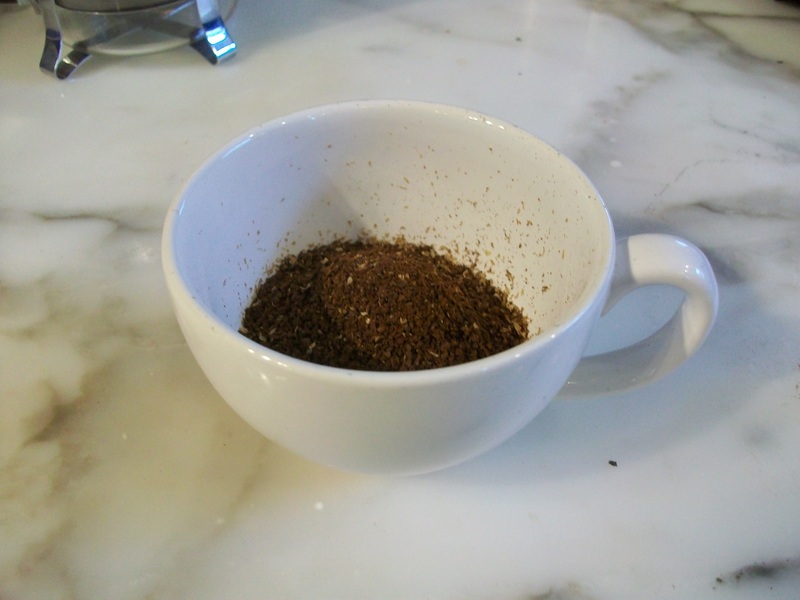 Now, dump all the grounds into the glass beaker, if some get on the sides, worry not, dear reader! Between the water you’re going to pour in and the plunger, any and all grounds will be scraped from the sides by the plunger (also a perk of a coarse grind, easy to clean). Start stirring in some water, just under the boiling point, into the glass beaker. Stir while pouring. How much, you ask? 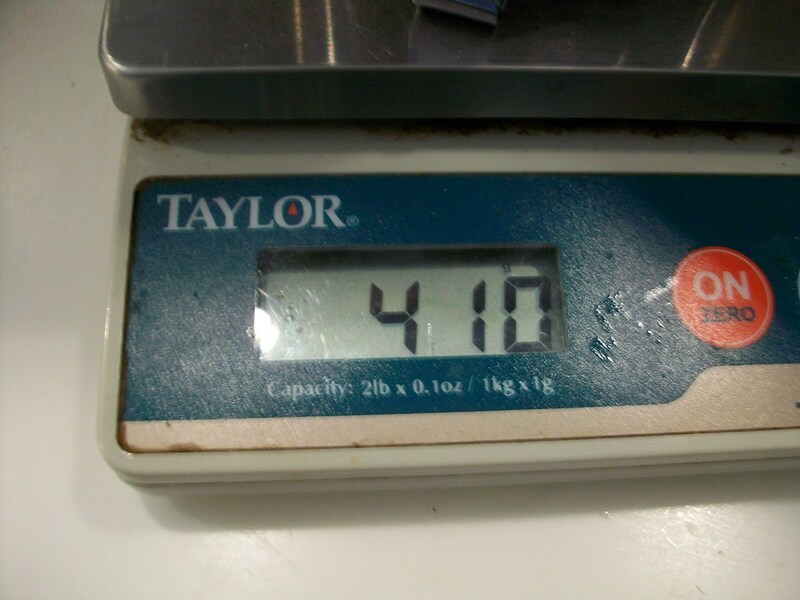 410 Grams, exactly. Yes, I AM that good. If you can’t find a scale that is this precise, just eyeball it. It should be abouta half inch from the top metal ring thingy. Just look at the rest of the pictures and guesstimate. That wasn’t so bad! Time seemed to just fly by. Now that it’s all brewed up, slowly press down the plunger until until you’ve hit bottom. All that’s left now is to pour it out, add cream and sugar if you need it (which you don’t, this tastes fantastic black), and enjoy!! If you have any questions about how to do this process, feel free to call us, or ask us, or whatever you need to. All of us here know how to do it, and we’d love to help put you on the right track. Ok, that’s all I’ve got for you today, Graham’s friends. 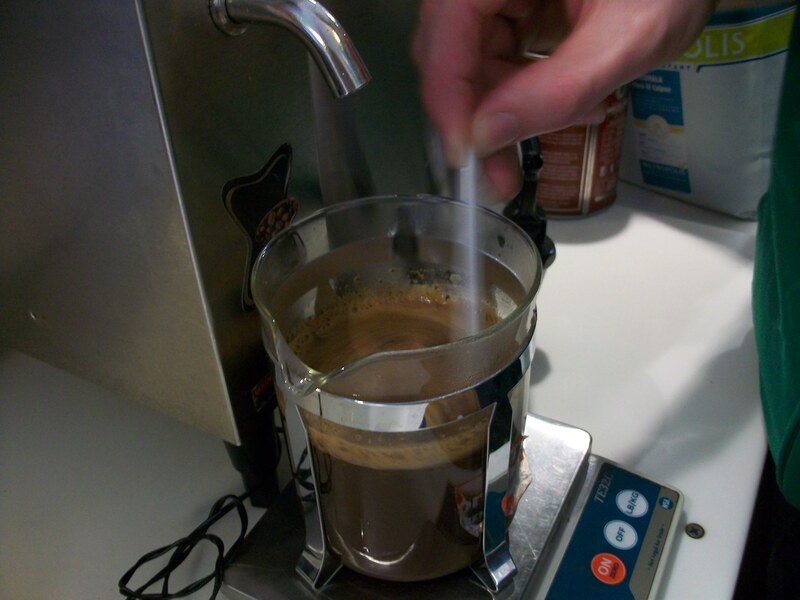 If you’re Facebook friends with us, send us pics of you making your own single-cup stuff! We love seeing our amazing pals doing what they love. And if you’re more of a Twitter person, you can follow us at @grahams318. Stay in touch! ~ by grahamschocolate on February 9, 2012. 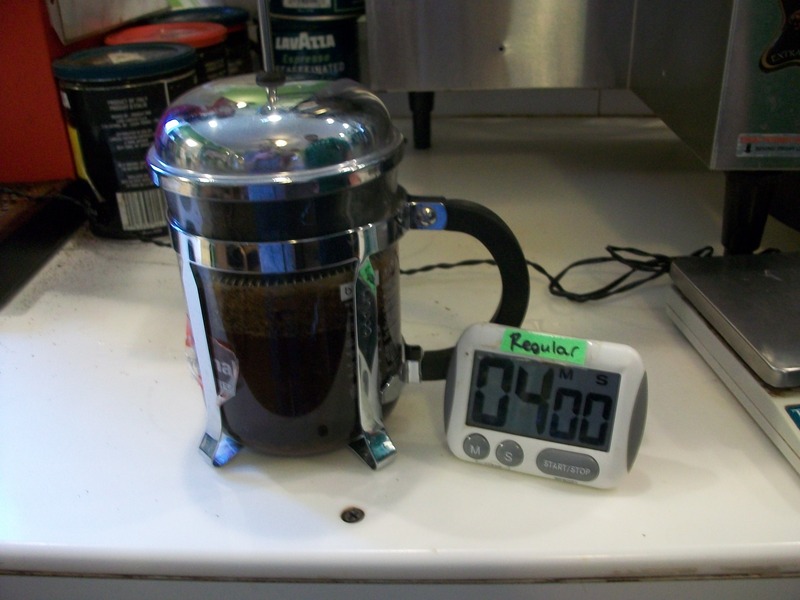 Great tip about not pressing the plunger down all the way until the timer is up…I make a press pot almost every afternoon, in my opinion it’s the absolute best way to make coffee. I usually buy Trader Joe’s, I like the Pajaro blend or the Dark French Roast. But my new fav is Starbuck’s Dark Espresso Roast, I just tried it this week and it’s fantastic. 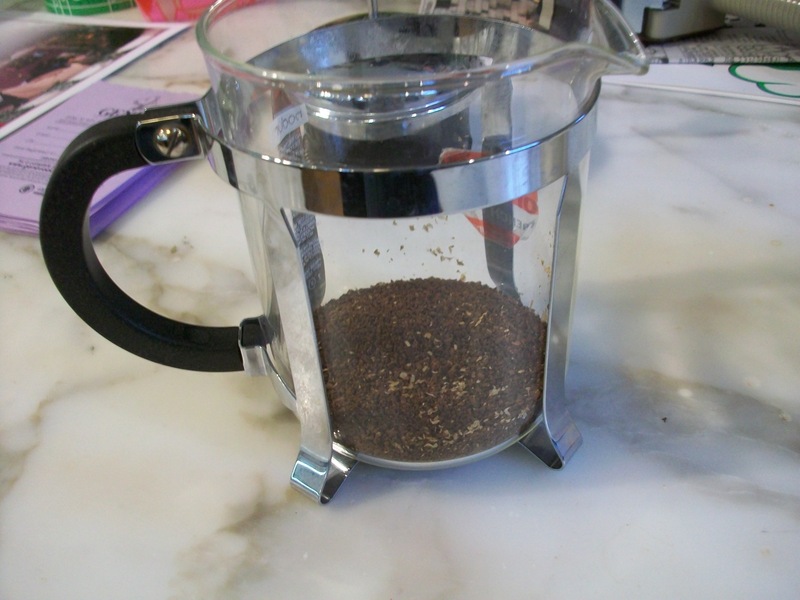 I usually make a moka pot of espresso in the morning and then later I make a press pot. Yea, I like coffee a lot! Honestly, I know I work here and all, but our espresso, the Metropolis Redline is pretty fantastic. I also dig some Dillano’s. They have a really good French Roast. Also, if you’re from Geneva…Check the coffee drop shop, they roast their own beans, meaning you get a REALLY oily bean, resulting in some seriously smooth coffee.